Though we give them individual names for our own convenience of reference, there is no such thing in the world ocean as a singleton current that, like a river, begins at one point and ends at another. As we said earlier, all the surface currents within a particular ocean’s gyres are but arcs on a circle. 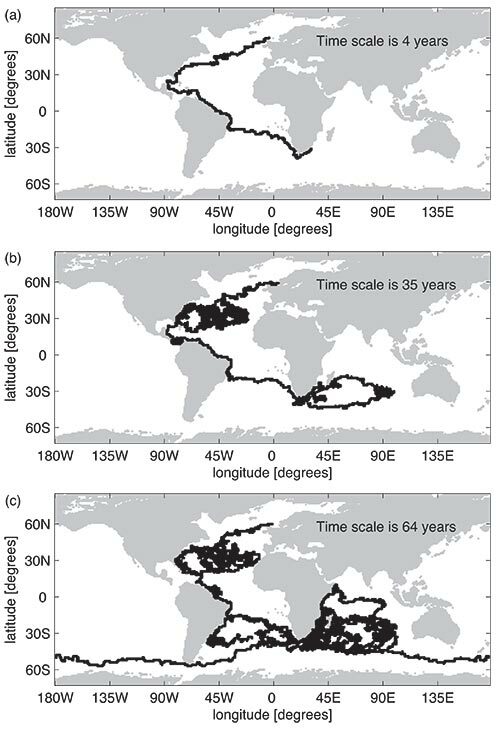 Further, the gyres are connected from ocean to ocean. 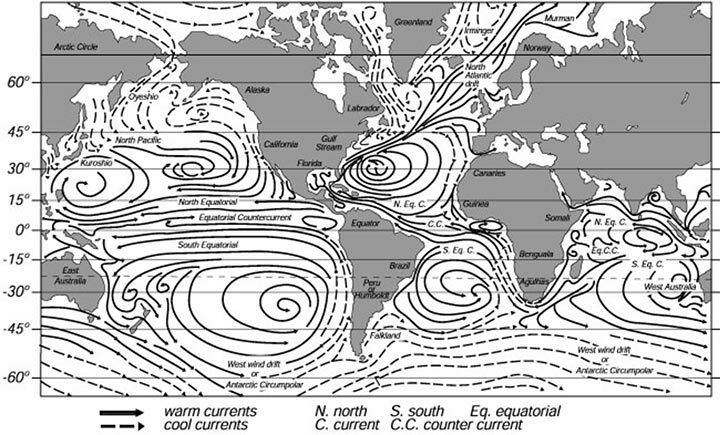 To illustrate and expand on this point, demonstrating that surface currents are also connected to deep currents, let’s follow a parcel of water on its inter-hemispheric voyage. 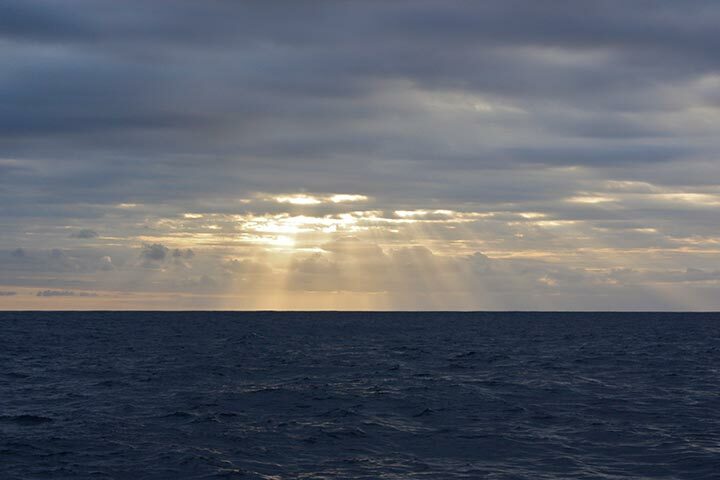 We could begin anywhere, it’s worth noting, but since we’re here in the Agulhas, let’s start at Lisa’s study line at about 34° South latitude, where the current sprints southwest along its western boundary at some four knots. Not far downstream, however, that boundary, the African continent, expires. When our water parcel passes that point, one of two things will happen. It will take a hard left turn in the Agulhas Retroflection bound for Australia; indeed, it may orbit the Indian Ocean basin indefinitely in the Subtropical Gyre. But, no, let’s assume it goes the other way—eddying westward around the Cape of Good Hope in one of those Agulhas rings, part of the leakage, into the South Atlantic. There it may be entrained in the counterclockwise turning South Atlantic Subtropical Gyre and do a few orbits of that ocean. Eventually, however, it may be directed over the northern arc of the gyre toward the Bulge of Brazil, there to be entrained into the North Brazil Current and carried across the equator into the Caribbean Sea. From there our water parcel will be directed northward though the Yucatan Channel into the Gulf of Mexico—and the Gulf Stream. Like its kindred Western Boundary Current, the Agulhas Current, the Gulf Stream flows warm and fast toward the pole (except now it’s the opposite pole). Now, having entered the North Atlantic Subtropical Gyre, the parcel may loop around and around between North America and North Africa. However, it may also become entrained in that extension of the Gulf Stream System—the North Atlantic Current (NAC)—and head for Western Europe. Remember, please, that our water parcel is warm and salty and that it has been traveling aboard surface currents, even though “surface” can mean thousands of meters of deep. So when the west winds blow across the NAC, they carry its warmth onto European shores, treating Britain and Norway to a far gentler climate than their high latitudes would otherwise deserve. But now, proceeding still farther north, as our parcel is being chilled by Arctic air in the Iceland/Greenland basin, it grows denser, which is to say heavier, and now a remarkable series of oceanic events is about to happen. First, due to its increased density, our water parcel sinks, plunging over submarine mountain ranges into opaque North Atlantic Depths, where something truly astounding happens. 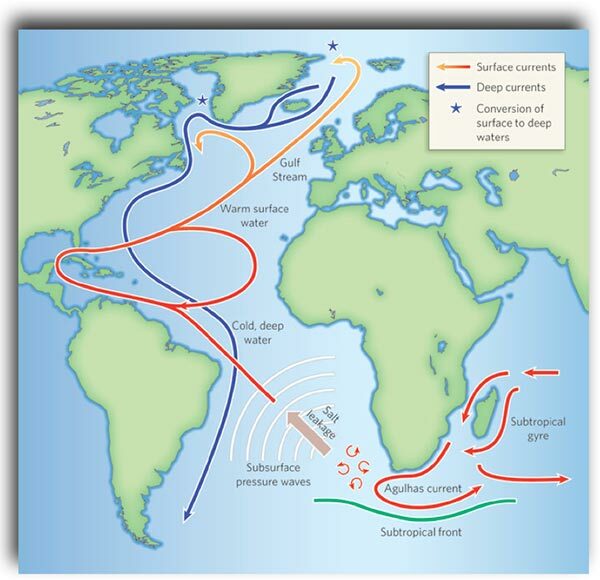 The sunken water (“convected” in technical lingo) forms up into a relative narrow stream—the Deep Western Boundary Current—to flow back southward beneath the Gulf Stream and “under” the equator into the Southern Hemisphere. I’ll never forget the level of wonder I felt when some years ago I first came to understand (with Lisa’s patient tutoring) this magnificent exchange of water from north to south on the surface and in the deep, and the resulting balance of mass that nature produces simply because the wind blows and the Earth rotates. And then there is this: That the ocean transports heat toward the poles and cold back toward the equator, we are—quite coincidentally—graced with a more moderate climate and therefore a more comfortably habitable world than would otherwise be the case.